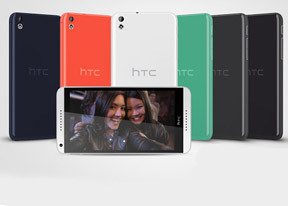 HTC's latest mid-range offering in the face of the Desire 816 can easily be described with one word - delightful. To begin with, it's a very handsome 5.5" phablet boasting similar looks to the company's flagship, the HTC One. Naturally, being a mid-range offering, the Desire 816 is built with plastic, which thankfully is soft touch and feels great. And just like the One, the Desire 816 features stereo front-facing speakers. We tested them out and even in the loud MWC environment, they were excellent. The 720p display is also excellent. We are particularly impressed with the wide viewing angles making the phablet perfect for sharing media with friends. The Desire 816 is powered by a Qualcomm Snapdragon 400 processor with a 1.6GHz quad-core CPU and Adreno 305 GPU. The 1.5GB of RAM will allow trouble-free multi-tasking, while the 8GB of internal storage, expandable via microSD, will try and fit in all your content. On paper, the Desire 816 runs Android 4.4 KitKat with Sense 5.5 UI on top. However, we weren't allowed to photograph the UI as the phone will be launching with a newer version of Sense, which the company is still brushing up. However, the version of Sense which was running, albeit not the latest, was running plenty fast on the Snapdragon 400 CPU. Web browsing was great, too. We are confident the Desire 816 will make for a great multimedia consumption device, but we do hope HTC gets the pricing right when the phone launches in April.